This C3 research memo introduces demography into widespread discussions of the multiple, ongoing, rapid, and intersecting transformations – political, economic, cultural, technological, etc. – that are profoundly re-scripting social life. While the new normal has yet to emerge, pronouncements of the end of the old normal within both industry and academia have become comical in their combined implications, ranging from the end of childhood (The Guardian, September 12, 2006), to the end of adolescence (Graham, 2004), to the end of marriage (Lewis, 2002), to the end of motherhood (Newsweek, May 29, 2006), to the end of fatherhood (Paul, 2010), to the end of the job (Bridges, 1994), to the end of colleges (Rosenberg, 2009), to the end of the Internet (Prince, most interestingly; The New York Times, July 6, 2010), to the end of men (Rosin, 2010), and to the end of grandparenthood (if we take seriously the argument for “killing granny” in recent US health care debates; Thomas, 2009). In the context of media fandom, the recent anthology I co-edited with C3 colleague Jonathan Gray (and Cornel Sandvoss), Fandom: Identities and Communities in a Mediated World (2007), was bookended by a debate over whether fandom is the dominant mode of consumption in late modernity and thus everyone is now a fan (see our Introduction), or whether, since everyone is now a fan, the term has lost its meaning and no one is a fan (see Henry Jenkins’ Afterword) – the end of media fandom, in other words. A “beyond the headline” reading of these various works reveals (unsurprisingly) that none of these phenomena are actually ending but rather altering in erratic ways and with ambiguous outcomes. 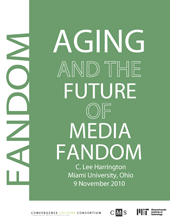 As such, and as indicated by the title of this report, I examine not the end but the future of fandom in this memo, with particular focus on demographic and life course transitions currently underway – the aging of the global population and the dismantling of the 20th century life course in Western nations – and their potential impact on fandom. We continue to (over) associate fandom with childhood and adolescence, but the normalization of fandom over the past 10-15 years combined with demographic realities suggest the importance of better understanding fandom and adult aging. The age-related structure of fandom at the turn of the 20th/21st centuries. The possible future of fandom given demographic and life course transitions currently underway. Throughout, I emphasize the developmental opportunities and challenges associated with aging and the growing importance of conceptualizing older adults not as surplus audiences but as core audiences. C. Lee Harrington is Professor of Sociology and Affiliate of the Women's Studies Program at Miami University. Her areas of research include television studies, fan studies, and the sociology of law. Her long research collaboration with Denise D. Bielby has focused on the daytime soap opera genre, its audiences and fans, and its global circulation. Their joint work includes Soap Fans: Pursuing Pleasure and Making Meaning in Everyday Life (1995, Temple U. Press), the edited collection Popular Culture: Production and Consumption (2001, Blackwell), and an in-press book on global television distribution titled Global TV: Exporting Television and Culture in the World Market (2008, NYU Press). She also recently co-edited an anthology on fandom aptly titled Fandom: Identities and Communities in a Mediated World (2007, NYU Press; with Jonathan Gray and Cornel Sandvoss). Harrington has also published on issues of sexual representation on television in Feminist Media Studies and Journal of Broadcasting & Electronic Media. Current research projects include a study of acting and aging on daytime soaps, and a study of media framing of death row volunteers (inmates who want to be executed). She received her PhD in Sociology from the University of California-Santa Barbara. Lee can be reached at harrincl@muohio.edu.